I’m thrilled to be writing about my new favorite eatery in Cumberland Valley, Cornerstone Coffeehouse in Camp Hill. I’ve frequented Cornerstone for years, stopping in for a mocha or iced tea, but shamefully never for their food. I’ve been missing out big time! Cornerstone has mastered mashing up textures (they seem to always find a way to add just a little bit of crunch - which I love) and flavors. Disclaimer - I&apos;m be no means a foodie critic, so my words may not do the flavors justice. Be kind to yourself and experience their food firsthand. First, I want to mention that Cornerstone Coffeehouse makes pretty much everything from scratch (bonus points), including soups, jams, salad dressings, seasonings (which they mostly harvest from their herb garden), and baked goods (except their bread). Most of their menu is on the healthier side. For those of you that think healthy equals not filling or lack of taste - I can assure you that you&apos;ll be the satiated (with a little bit of room for a necessary treat) and they have not sacrificed flavor - quite the opposite in fact. Havarti & Fig Baguette - This is definitely now my favorite sandwich and the best sandwich I ever had! I love it so much that I went back the next day and had it for lunch because I needed a fix. 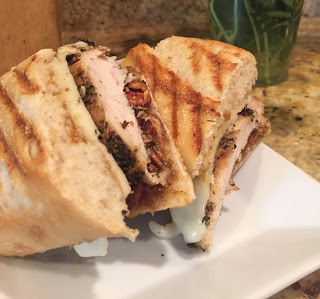 The taste is so unexpected - savory and sweet perfection - homemade fig jam mixed with toasted pecans, topped with seasoned chicken breast and melted havarti on a crispy grilled baguette. You won&apos;t want the deliciousness to end. 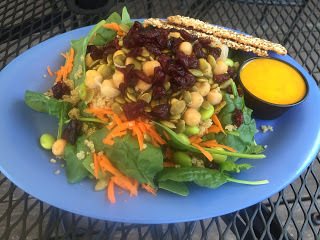 Super Protein Salad - My favorite salad - The perfect mix and ratio of quinoa, edamame, chickpeas, pumpkin seeds, carrots and craisins over baby spinach with an amazing and refreshing Asian-inspired carrot ginger dressing. TIP: You can get their salads to go - don&apos;t be concerned by the small container size - it is incredibly filling and you get way more than you think. My husband said, "This fit into there?" Baby Kale Power Salad - The lemon honey dressing was tangy, the berries were sweet, the feta was nice and creamy, and the toasted almonds added a delightful crunch. It was a great balance of savory, sweet, fresh and filling. 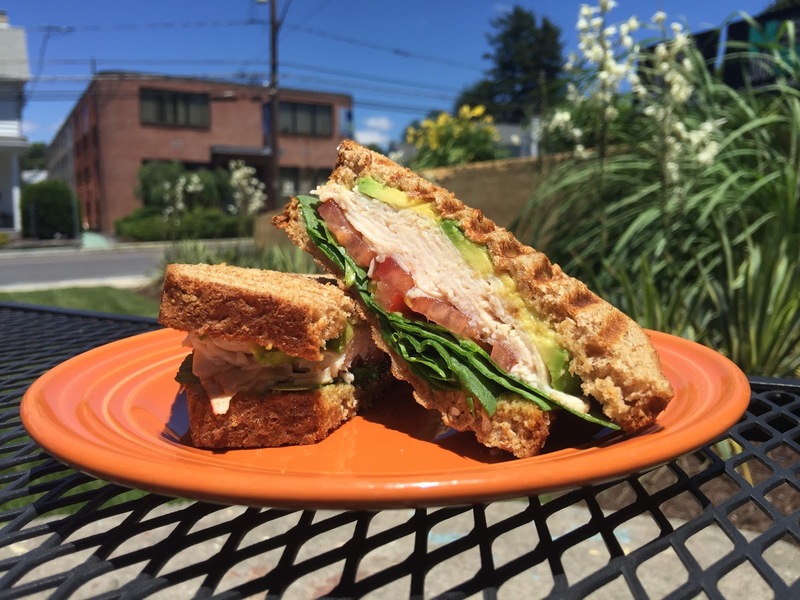 The California - This sandwich was very light and summery - grilled whole wheat bread, thick slices of turkey, bright red tomatoes, fresh lettuce, and smooth, buttery avocado finished off with a creamy pesto mayo spread. Typically I like cheese on my turkey sandwiches, but with this combo I didn&apos;t miss it one bit. South of the Border - A grilled honey wheat wrap with turkey, crisp bacon, melted pepperjack cheese, tangy sun-dried tomatoes, ripe avocado and chipotle mayo with just the right amount of spicy. This was my husband&apos;s favorite. 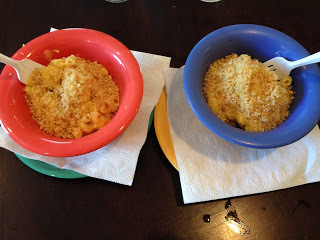 Homemade Mac n&apos;cheese - My three-year olds split a serving. This was their favorite! The crunchy buttery panko on top of the rich and cheesy macaroni was oh so yummy. Breakfast Cookie, Trail Mix Cookie. 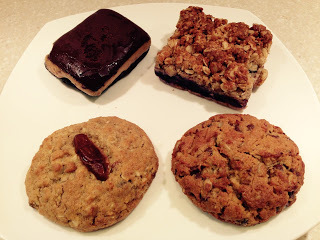 Dessert and Baked Goods - Oh my! Oh my! Where do I start? I could make a meal out of their desserts. The Peanut Butter Dream is incredible! The bottom layer is thick, soft and moist and has mini chocolate chip surprises throughout - layered with smooth creamy peanut butter and chocolate to top it off. The flavors melt in your mouth. I didn&apos;t want the rich goodness to end. The Oat Bar has a thick layer of blueberry goo that holds the crispy oats on top. The Trail Mix Cookie is trail mix in a cookie. Love it! Perfect to take on a hike! The soft healthy Breakfast Cookie (which is the number one seller) has honey, wheat germ, whole wheat flour, dates and grape nuts, which adds just a little crunch. Beyond the food, Cornerstone is welcoming, cute and fun. You can sit inside or outside on the deck. The people are great...you can tell that they put a lot of love into everything they do. They support their local artists and have art on display. They have live music on Friday, Saturday and Sunday nights. If you are looking for somewhere to host a baby or bridal shower, a meeting or a catered private dinner their backroom is the perfect place! 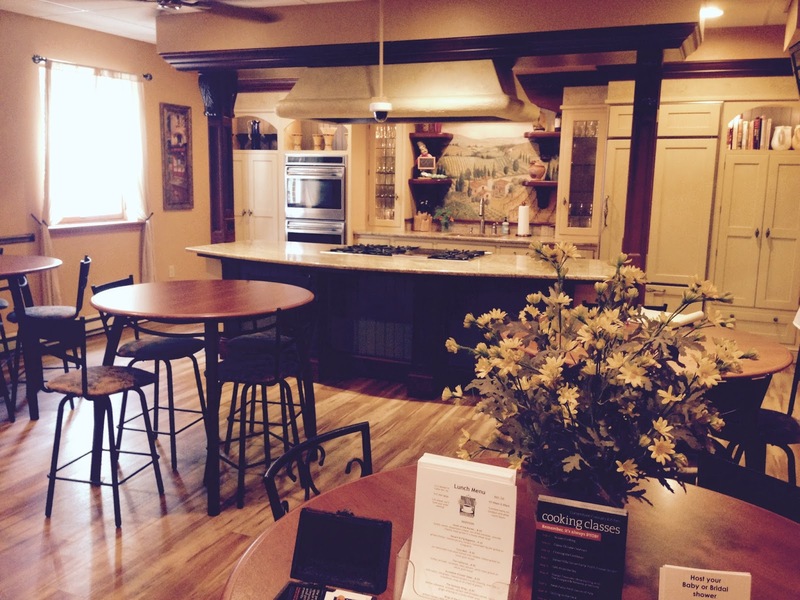 This is also where they offer cooking classes with Chef LaPorta. From Wild Game Favorites to Tuscan Treasures with wine pairings you&apos;ll see how the creations are made and get to sample a healthy portion of each. 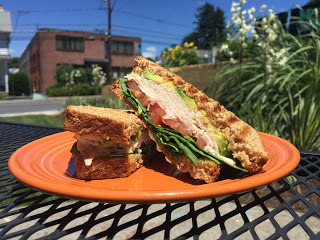 I&apos;ve only just scratched the surface of all the delicious items and experiences at Cornerstone Coffeehouse. My tastebuds look forward to continuing the journey.